Good Morning! How was your weekend? We had a free one as far as kid activities go, but a busy weekend for house projects. 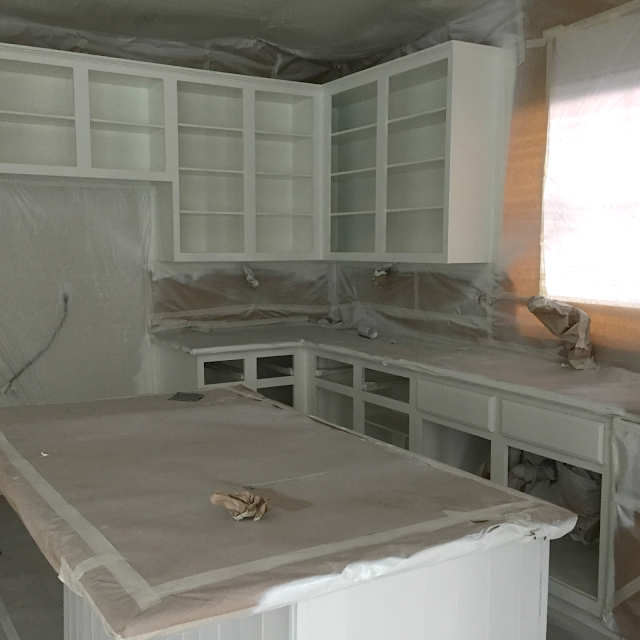 We received a call on Thursday that our painters wanted to come on Saturday to do our kitchen cabinets. So, Thursday night we kicked it in gear and started removing all the cabinet doors and hardware. And then I spent most of Friday emptying everything out of the cabinets. 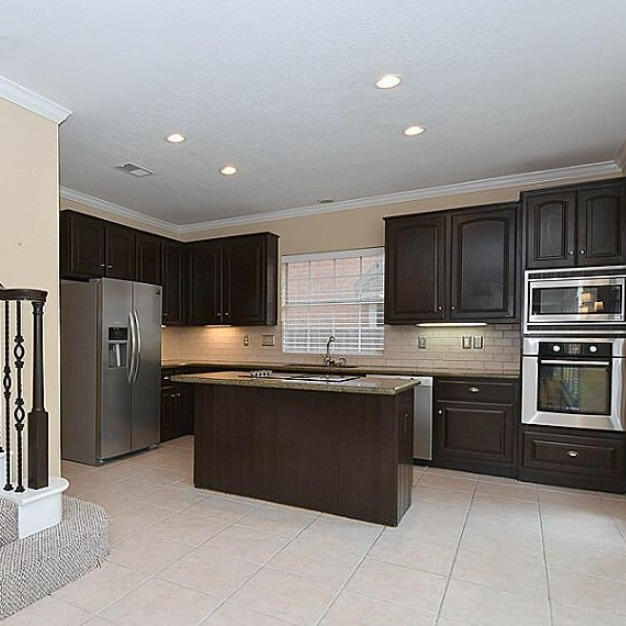 You may remember from a previous post I did about our kitchen that the cabinets were previously painted this dark brown color. 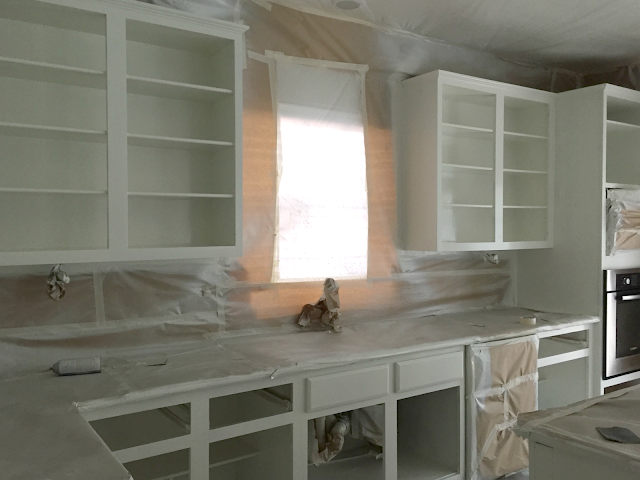 At first glance they looked like stained cabinets, but once close up we noticed they were actually painted. And unfortunately the previous paint job was not so good. 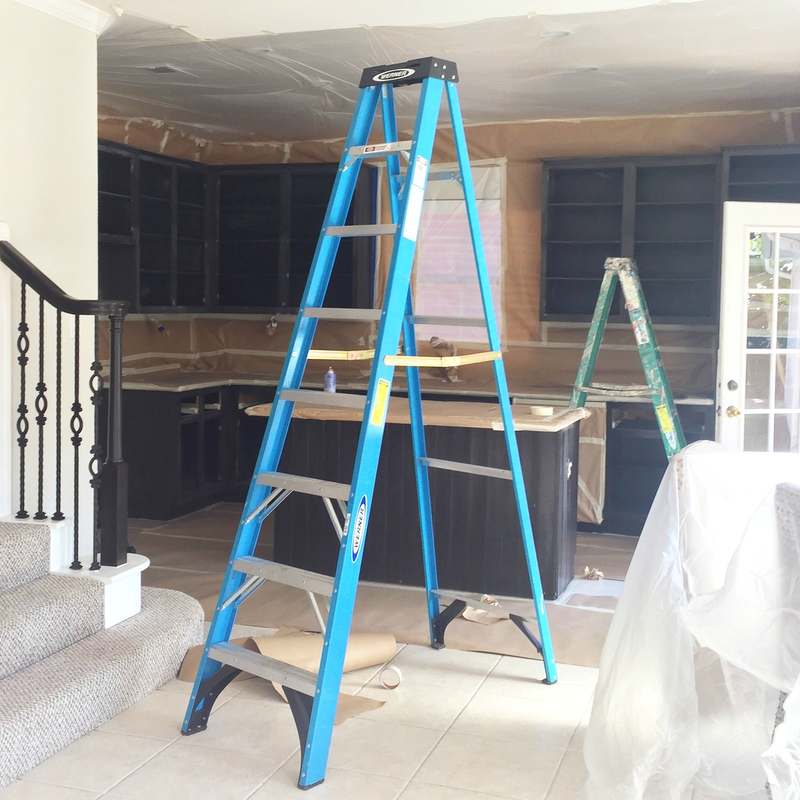 None of the doors, hinges or under cabinet lights were removed when they were painted and there were also lots and lots of runs. After we gave it some thought and ruled out replacing them which you can read about here, we knew if we were going to paint them, they would need some prep work. So after all doors, drawers, hinges, rollers and hardware was removed, they got a much need sanding. And because the hinges were painted over, we will be replacing all of those, as well as putting new hardware. 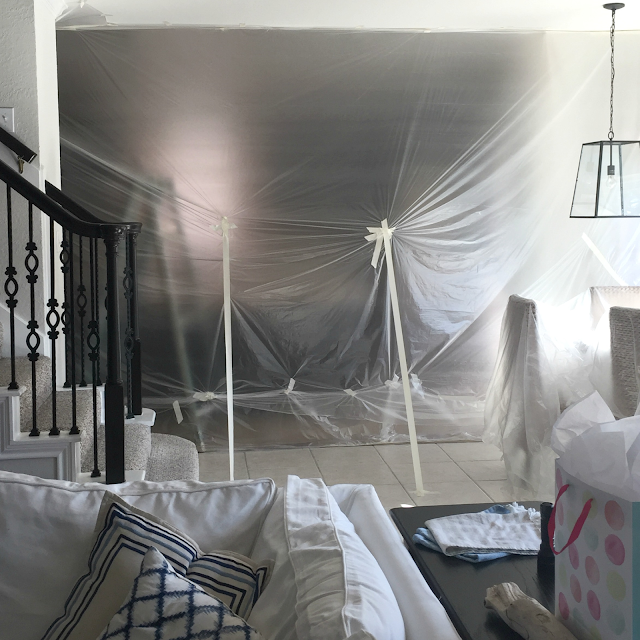 The painters ended up spraying the cabinets and this was our view for all of Saturday. Despite the really strong smell, I love how fast the spray technique goes and love the nice smooth finish it leaves. The last two pictures above were early on Sunday morning. I was able to crawl in this plastic tent and snap a few pictures. We did get all the protective materials down on Sunday, but we are still allowing the doors and drawers to fully cure before anything goes back in place. 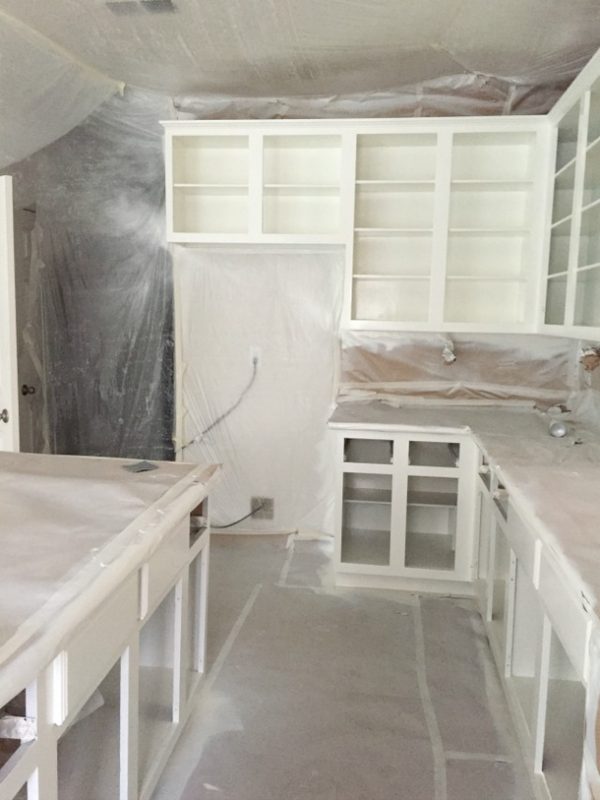 The paint color is Benjamin Moore Simply White in a semigloss finish. 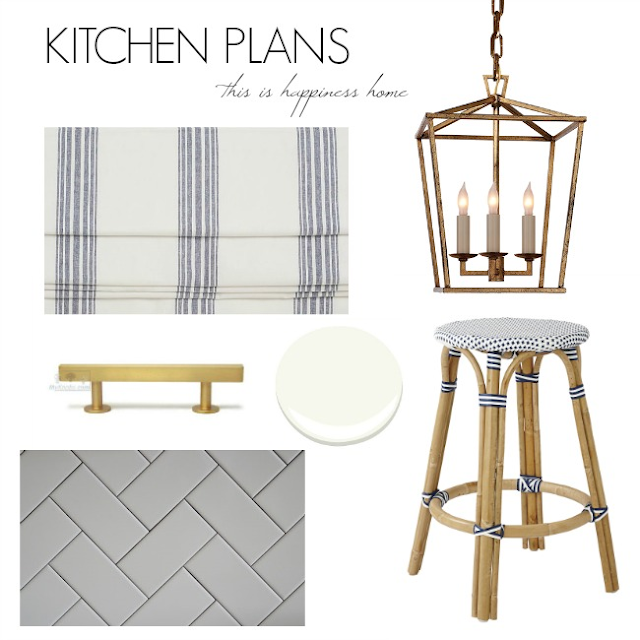 And just a reminder of what our final look for this kitchen is, here is the inspiration board I created. I was originally unsure of how the white cabinets would pair with our granite color, but I'm excited to say that I really like it! Yay!! Next up will be trim work and the backsplash. I hope to share more progress soon! Looks like its going to be so pretty! Thank you Taylor! Still lots to do, but glad to have this big task done! Oh wow, how pretty, can't wait to see it all done. This is going to look fabulous!!! Thank you Shelley! Can't wait!